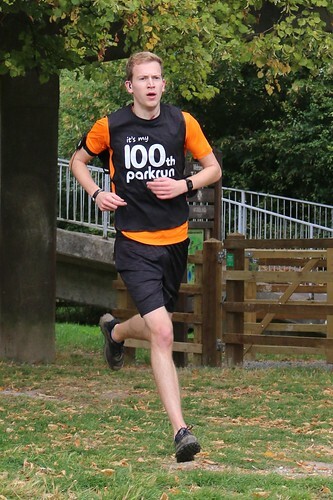 “Welcome to parkrun ------- 10” - sorry for the confusion on Saturday when the microphone cutout briefly – clearly we are on parkrun 210 not 10! 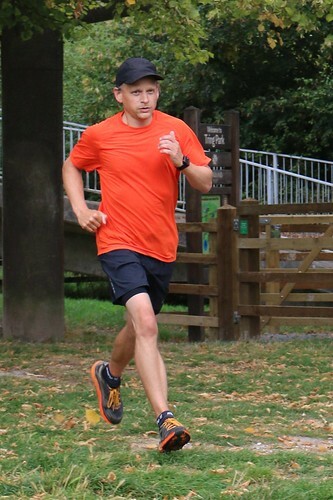 Those minutes just before parkrun have to be among my favourite time of the week. Although it can be a bit hectic if you are the RD, for most people it’s a time to catch up with what your friends have been doing since you saw them last, or perhaps meeting a tourist and making new friends. Or maybe you’re a first timer and listening to the First Timers Briefing. Just looking at the picture picture below makes you hear all the chatting that is going on. Have you got pen and paper ready? 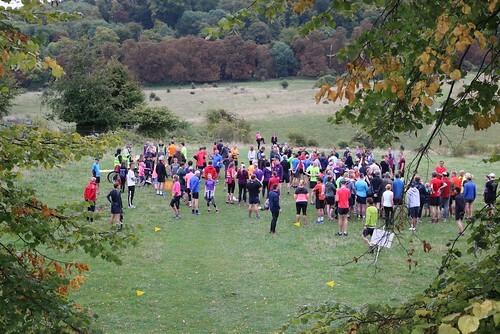 On the front right Vicky and Jamie were presenting their 1st timers brief - Looking at that group, estimate how many people were running at Tring for the 1st time? 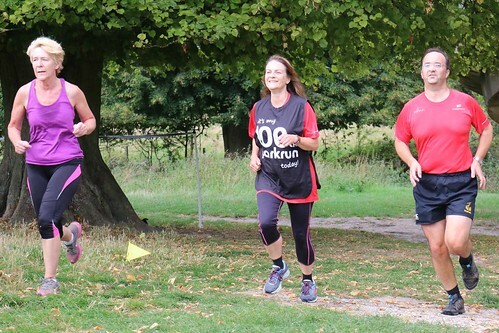 For a bonus point – of these – how many do you think were running their 1st ever parkrun? Looking at this group of runners – what minute do you think was the busiest? It wasn’t the busiest minute, but it did break it’s own attendance record – which minute was this? On the far left you can see some volunteers getting ready. 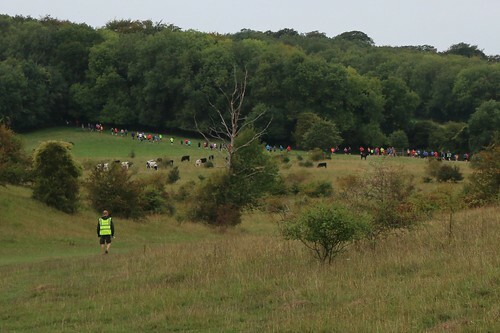 Remembering to count those who help before and after and that the cow and gate marshals would already be on their way to their positions – how many volunteers do you think there were on Saturday? In the background Amy is doing her stretching – The name Amy beat it’s previous attendance record of 2 – how many Amys ran this week? 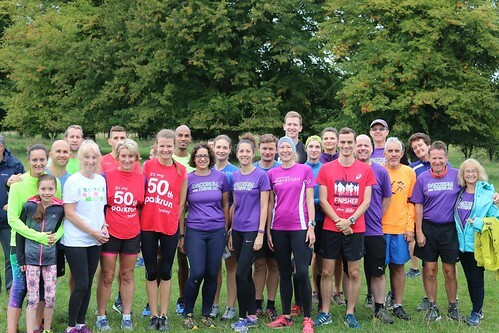 In the middle of the picture, in one of our red “50” bibs – you can see birthday girl Sophie, one of 5 milestoners this week. 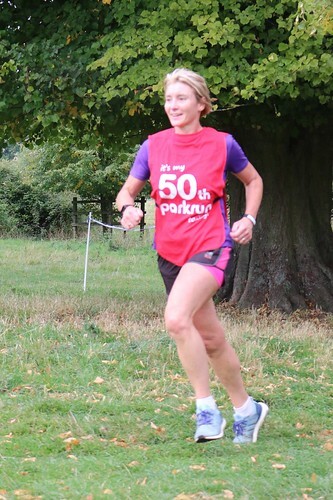 If running your 50 and having your birthday wasn’t enough, of those who have run at least 5 parkruns she had the most impressive PB improvement. Question is, to the nearest minute, by how minutes did Sophie improve her PB by? In the picture near to Sophie, are a number in purple Dacorum & Tring tops. The club broke it’s record attendance (previously 15) - but how many were at Tring this week? How many of the famous Tring cows can you see in this picture? Near the front left Izzy Bladen, in purple, (who has run more at Tring than any other Junior) is chatting to James (Jim) Maple (who has played more music whilst marshalling at Gate 1 than anyone else). It’s great to see Jim back running again – but as he runs as James, he helped the name James beat it’s previous attendance record. So how many Jameses did we see? It was a cake fest at Tring Park today with probably the most cake we've had since our birthday - and impressively I think it all got eaten! Well done to milestoners - Naomi Wager-Leigh (100th), Neil Paterson (50th) and with Gadebridge closed today, a large group from Dacorum & Tring plus friends to celebrate Sophie Turner's birthday plus her 50th run, her brother Michael's 100th as well as Penny Wallduck's 50th - Cheers for all the cake. Fastest finisher Ollie Grimette set the 3rd fastest time for his SM20-24 age group with his 17:41. It was also the 7th fastest time ever that we have seen at Tring and the fastest by someone with no club against their name – so if any clubs need to improve their cross country teams…..! Scarlett becomes fastest in her age category for the 2nd time - Well done! 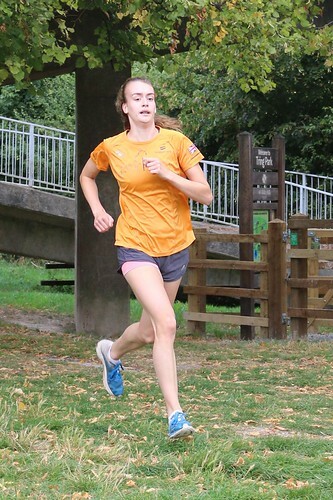 If you want to pick up a Tring PB look out for in form runners - These are the group you should try and keep up with at the moment…..
And so to our quiz answers…. 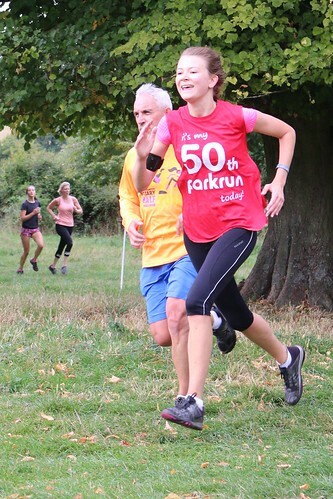 Well done Sophie - birthday, PB and 50th parkrun! With Gadebridge closed this week, 24 runners from D&T visited Tring. Only Tring RC have had more runners on a specific week. Zero – no it’s not a trick question! That’s how many we saw when we set up the course – but at 8:55am they magically appeared in the middle of our course - luckily they wandered off just in time. 10 out of 10 – Excellent performance – do you fancy writing next week’s run report? 0 out of 10 – OK some of the questions were tricky but where did you see the cows? !